This recipe was made in partnership with Country Crock. 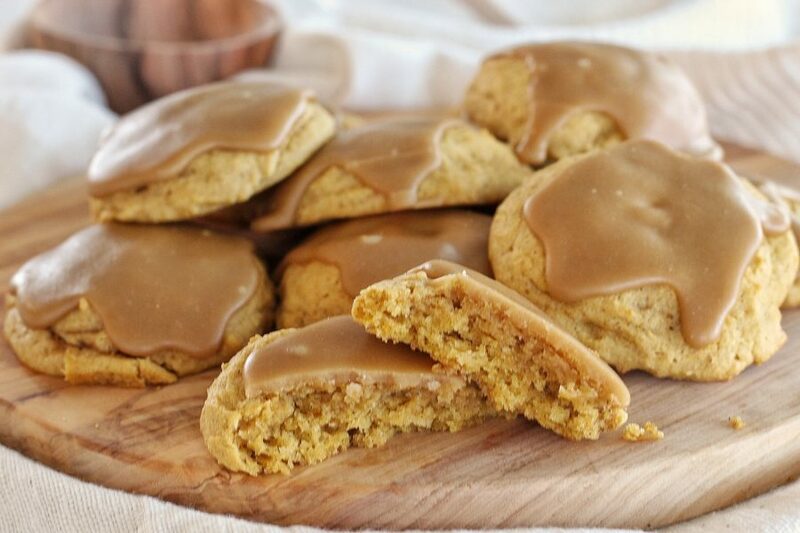 For as long as I can remember, there hasn’t been a November that goes by without my mom or sister or me whipping up a batch of these Pumpkin Cookies with Maple Glaze. They are family fall staple at my house. As kids, we requested them every year and easily devoured them within a day. I have always loved helping my mom in the kitchen. I distinctly remember studying how she made certain things, like the glaze for these cookies. (The trick is spreading the glaze as soon as it’s cooked or it will get too thick and hard). And the smell! Oh how I remember and love the smell of these spiced pumpkin cookies baking in the oven. It just wouldn’t feel like fall without a batch of these cookies. 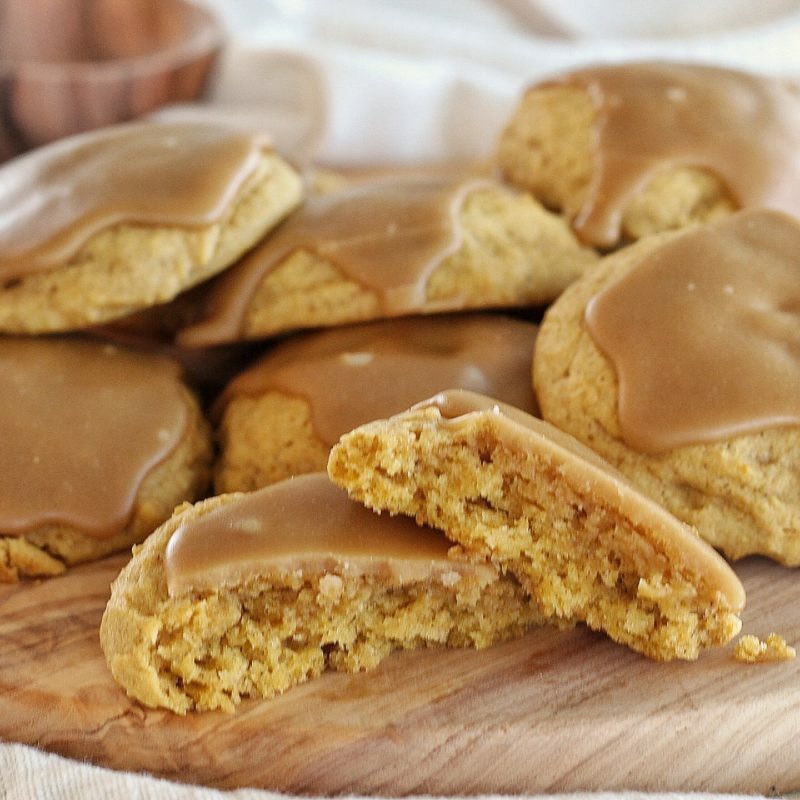 These cookies are so simple to whip up and you’ll most likely have everything you need already in your pantry, especially this time of year with all the pumpkin treats you’re making. The cookies are a blend of brown and white sugar, whipped with Country Crock Baking Sticks. I love these baking sticks because there’s no need to wait for them to soften. They’re good to go straight from the fridge. They whip up into a soft and creamy texture in seconds and create a light and fluffy texture to baked goods thanks to the sunflower oil in them. Plus, they have 45% less saturated fat than butter! Once you beat the sugars and baking sticks together for a couple minutes, it’s just a matter of adding an egg, vanilla pumpkin and then the dry ingredients. So simple, in fact, these cookies are the perfect baked good for your kids to help with. The glaze for these cookies is a game changer. It’s so delicious! 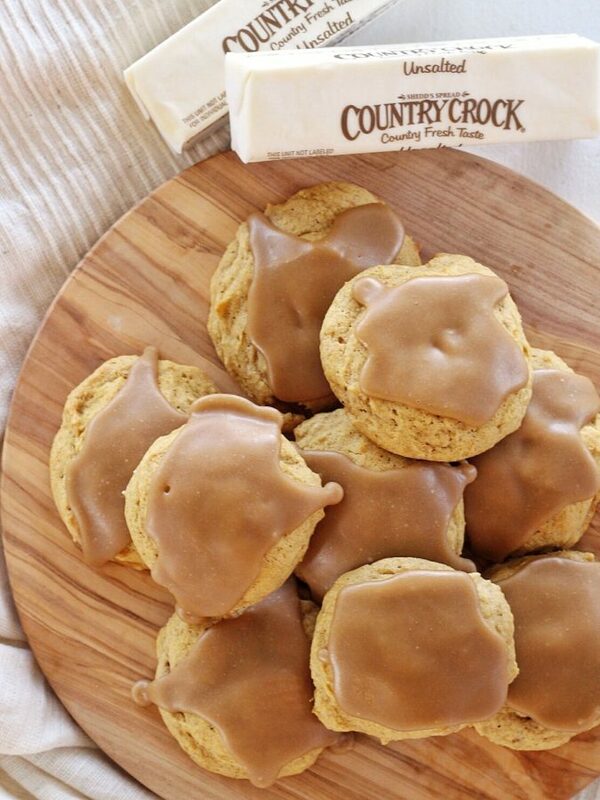 The maple flavoring from the dark brown sugar is the perfect complement to the pumpkin spice cookies. As I mentioned above, the one trick to this glaze is making sure you spread it on the cookies immediately. If you wait too long to add the glaze to the cookies, it gets too thick and too difficult to spread around on the soft cookies. 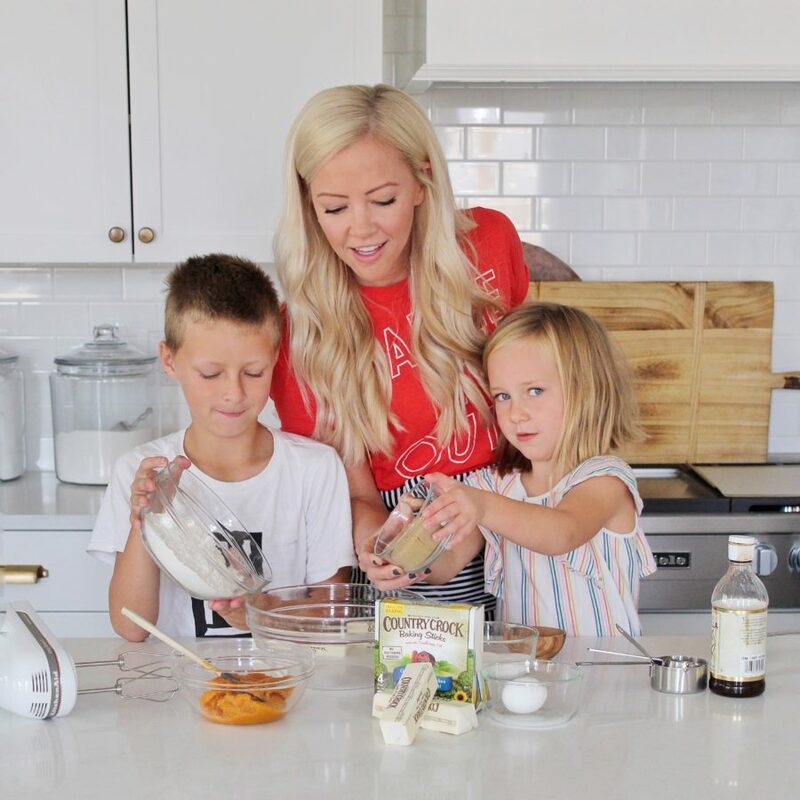 I’m so excited for you to try these simple and delicious cookies. I hope you and your family love them as much as we do! *This post was sponsored by Country Crock. 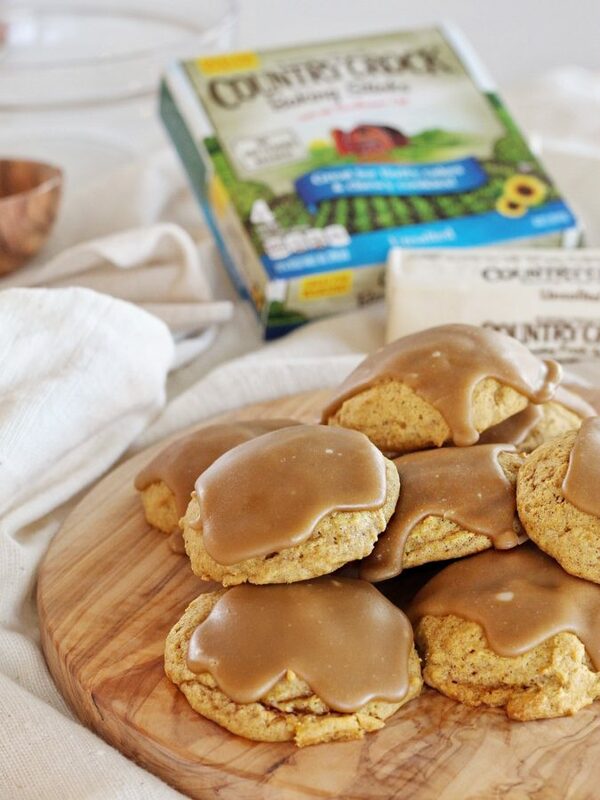 Tender pumpkin cookies with a maple glaze. Preheat your oven to 350 degrees F. Line two baking sheets with parchment paper. Set aside. In the bowl of an electric mixer, fitted with the paddle attachment, cream together the baking sticks and sugars until light and fluffy. Add the pumpkin, egg and vanilla. Mix until incorporated. On low speed, add the flour, baking soda, baking powder, salt and pumpkin spice. Using a cookie scoop about 1.5 inches big, drop cookie dough about 2 to 3 inches apart on the baking sheet. Bake for about 12 minutes, until the edges are golden brown. Let cool for about 30 minutes before adding glaze. Heat the butter and brown sugar in medium saucepan until bubbly. Cook, stirring constantly for 1 minute. Will be a little thick. Stir in the milk. Blend in the powdered sugar until the mixture is smooth. Pour the glaze by the spoonful over each cookie. I made these cookies today. I had to modify them and make them dairy free. My glaze looked more like a caramel sauce And didn’t harden like yours seems to be.. I’m wondering what I did wrong 🤔 Is it because it’s dairy free? Did I not cook the glaze long enough? Any advice would be appreciated! Thank you! Hi, yes, it could be that yours was dairy free and that you didn’t cook it long enough. These look incredible, and I’m looking forward to giving them a try! I’m just wondering, where is the maple in the recipe? I might be overlooking something. You mentioned maple flavoring in the dark brown sugar, but I thought brown sugar was just granulated sugar with added molasses. Are you using a special type of dark brown sugar? There’s no actual maple flavoring (though you could add some, if you wanted to). The dark brown sugar creates a maple flavoring as it gets cooked. Okay, I see. Thank you for the response, and thanks for sharing the recipe! What are country crock baking sticks is it butter iv never heard of them being soft? Butter u have to set out so it will soften? They’re just already softened butter sticks but you can use butter too.